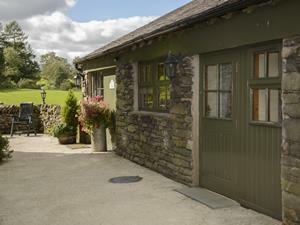 Stable Cottage Self-cateringThis newly converted former stable is situated within the steading at High Wray Farm. The cottage has two ensuite bedrooms a lounge dining area and kitchen, equipped and furnished to a very high standard, with stripped pine floors and original exposed beams. This newly converted former stable is situated within the steading at High Wray Farm. Situated in a quiet unspoilt location, views, woodland and lakeshore walks from your door. This newly converted former stable is finished to a very high standard, with original beams and stripped pine floors. Your home away from home. Children welcome from age 5. Stable Cottage offers weekly bookings starting on Saturday. From the B5286 Ambleside to Hawkshead road, take the minor road to the left signed Wray and Wray Castle. Follow this road for 1.5 miles, driving past cottages at High Wray, the farm willl be seen on the right.